Now that it’s Halloween and New Orleans finally has a cool weather reprieve, we wanted to play off of the lower temperatures with a little color inspiration. Those looking to tie the knot this time next year need to start thinking about the little details, including color scheme. Typically, fall and winter months are imbued with dark, cool-toned colors or hues reflective of trees, animals and other natural elements. However, fall and winter color trends have been moving away from the traditional in favor of a fresh and unconventional approach to color schemes. Here are some of our favorite additions to the fall and winter lineup. Burgundy – this wine color brings all the warmth of a winter hue, without being too dark or boring. It’s a rich accent piece that can be added in flower arrangements or table décor, but can also be the star of the show as a bridesmaids dress or men’s tie/bow tie. *Couch available through Lovegood Specialty Rentals. Black – As we reported recently, Martha Stewart gave her approval on using black throughout your wedding. Having all of your attendants sport this shade makes for a classic look and a color easily paired with light or dark accents. Greens – Emerald has been a Pantone color of the year, but that rich, bright color isn’t the only green that can make a statement. Try going to a darker green for an outdoorsy feel, or add in a lighter green as an accent or highlighter to your star color. Pastels – Pastels may seem as if they are only fit for spring, but this is not the case. A pale blue next to a rich burgundy or dark green adds for a perfect accent. Other pastels like pink or yellow blend perfectly with a more orange, bright theme or a bold purple note. Jewel tones (gold, silver, emerald, blue) – You have a tried-and-true classic in jewel tones. Ruby red, gold, silver — you can’t go wrong. 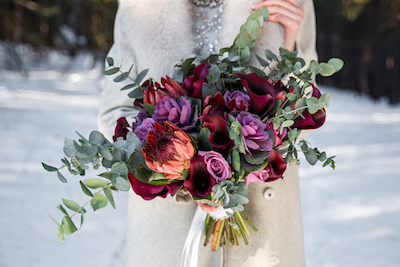 Champagne, gold toned bridesmaid dresses in the dead of winter add drama and a neutral palate to build up your darker hues like burgundy or navy blue. Pantone, authority on all things color, released its list for fall and winter 2017 colors earlier this year. Use these hues as a guide and you’re sure to be the best-dressed wedding guest.